Researchers map programmed cell death in immune cells to prevent allergy. Scientists from the CNRS, INSERM and Université de Limoges have demonstrated that the production of type E immunoglobulins (IgE)2 by B lymphocytes induces a loss in their mobility and the initiation of cell death mechanisms. These antibodies, present in small quantities, are the most powerful weapons in the immune system and can trigger extremely violent immune reactions or immediate allergies (asthma, urticaria, allergic shock) as soon as their levels rise, even slightly. These findings elucidate how our bodies restrict the production of IgE in order to prevent an allergic reaction. The opensource study is published in Cell Reports. Immunity is based on cells, B lymphocytes, which carry or secrete antibacterial or antiviral weapons, the immunoglobulins (IgG, IgM, IgA, IgE) or antibodies. Although these weapons of immunity offer protection, they can also sometimes turn on the body itself. This is the case for the most effective of antibodies, IgE, where even infinitesimal traces (these IgE are 100,000 times less abundant than other antibodies) can trigger extremely violent allergic reactions. The lymphocytes that produce IgM, IgG or IgA are numerous, easily identifiable and persistent (as memory cells). For hitherto unexplained reasons, the cells that produce IgE are rare and have thus been the subject of very little study. In order to understand the mechanisms controlling IgE, the scientists first of all used genetic engineering to force cells to produce these antibodies in large numbers. They then succeeded in demonstrating two principal control mechanisms. They showed that as soon as a B lymphocyte carries an IgE on its membrane, it freezes, swells, loses its pseudopods and becomes incapable of moving, although lymphocytes are generally highly mobile. The scientists also revealed that the lymphocyte activates several mechanisms leading to apoptosis, or programed cell death. This self-destruction causes the rapid elimination of lymphocytes carrying IgE, while other cells in the immune system are able to survive for up to several years. During evolution, the human body has developed several self-restriction mechanisms around one of their most powerful immune weapons, IgE. Because a cell carrying IgE can no longer move, it can only survive for a brief period, just long enough to play a short-lived protective role against parasites, toxins and poisons. It then self-destructs which strongly reduces IgE production and hence the triggering of allergies. The team now wish to explore in more detail the different molecular pathways governing this self-restriction. Indeed, these may constitute numerous new therapeutic targets whose pharmacological activation could block allergies, or even permit the reduction of other pathological B lymphocytes, such as those involved in lymphomas. Among immunoglobulins (Igs), IgE can powerfully contribute to antimicrobial immunity and severe allergy despite its low abundance. IgE protein and gene structure resemble other Ig classes, making it unclear what constrains its production to thousand-fold lower levels. 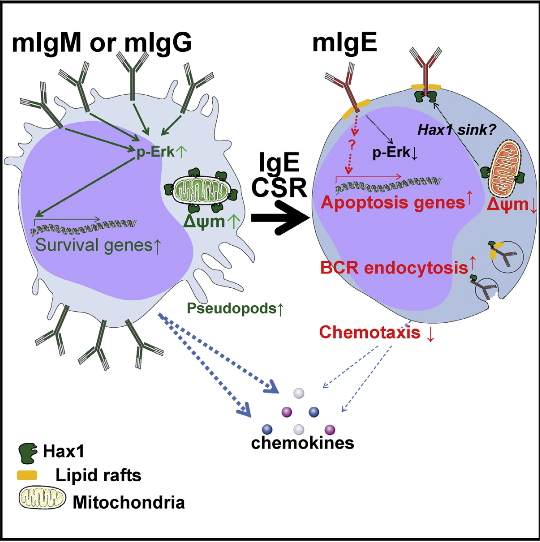 Whether class-switched B cell receptors (BCRs) differentially control B cell fate is debated, and study of the membrane (m)IgE class is hampered by its elusive in vivo expression. Here, we demonstrate a self-controlled mIgE+ B cell stage. Primary or transfected mIgE+ cells relocate the BCRs into spontaneously internalized lipid rafts, lose mobility to chemokines, and change morphology. We suggest that combined proapoptotic mechanisms possibly involving Hax1 prevent mIgE+ memory lymphocyte accumulation. By uncoupling in vivo IgE switching from cytokine and antigen stimuli, we show that these features are independent from B cell stimulation and instead result from mIgE expression per se. Consequently, few cells survive IgE class switching, which might ensure minimal long-term IgE memory upon differentiation into plasma cells. Self-Restrained B Cells Arise following Membrane IgE Expression. Cogné et al 2015. It is really interesting,it fills a gap in our information concerning low concentration of IgE in human sera,despite it crucial role in immediate hypersensitivity,now its role,in apoptosis of its producing cells.